Our work is guided by our belief that competition teaches more than good old-fashioned physical fitness. We believe in teaching life skills through the preparation for and competition in sport specifically-triathlon. To identify, develop and support junior triathletes for regional, national and international competition by providing a platform for training, racing, expert coaching and community support. 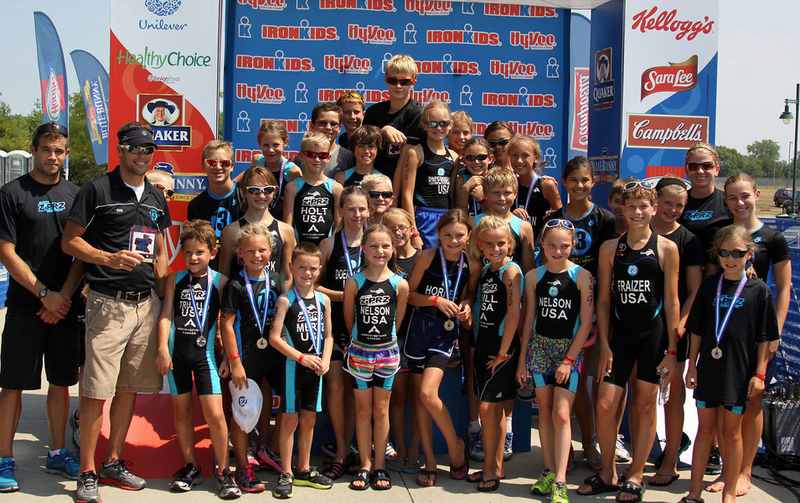 Our vision is to be the cornerstone high performance junior development triathlon team in the Midwestern United States. We strive to accomplish our mission by teaching life skills through sport. High Performance: 13-19yrs focusing on Hy-Vee Fit Kids (12-15)/NDL Sprint/Standard distance. Secondary focus on F1/EDR/Cup races. Competition: 10-18yrs focusing on Hy-Vee Fit Kids NDL Sprint distance. Secondary focus on F1/Cup races. ZiPRZ: 6-10yrs team members must be able to swim at least 25 yards, and have interest in learning about the sport of triathlon. Little ZiPRZ athletes train one evening per week from June through August. The goal of the team is to teach and improve swim, bike and run skills in a safe and supportive environment. Little ZiPRZ athletes compete in local, regional and National kids age group events.